On Friday, one hundred police officers and tourist police officers raided and roped off an entertainment complex in Chiang Mai, refusing to let tourists go, testing urine for drugs and arresting tourists without a passport on them. In a separate incident, again more than 100 officers raided Pattaya’s famed Walking Street and took dozens of foreigners in for interrogation because they were not holding passports. At 10pm last night, the Chiang Mai police raided the Zoe in Yellow entertainment complex, quickly roping off the area with police tape to stop anybody leaving or entering. Some of the police were armed with assault rifles. The police did random urine testing on many party goers but found no evidence for any substance abuse. No weapons, drugs or other dangerous items were found on any of the people there. Immigration police found no evidence of anyone overstaying their visas. All the tourists who did not have their passport with them were taken to Chiang Mai police station and processed. 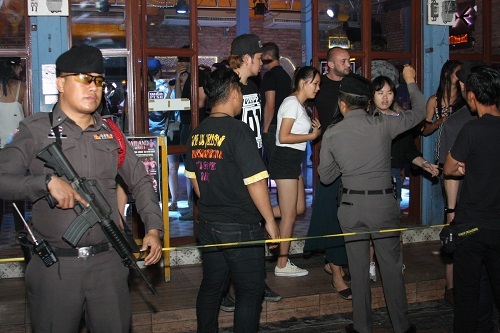 In the second incident, more than 100 officers raided nightclubs along Pattaya’s famed Walking Street early Friday morning and took dozens of foreigners in for interrogation because they were not holding passports. Officers from the Central Investigation Bureau and soldiers from the 14th Military Base went into five venues in the infamous nightlife and red-light area in what was billed as a crackdown on transnational crime, which ended up finding at least 30 foreigners without their passports. All of them were taken in for criminal record checks and were reportedly released after they were able to show their passports to police.